In February 2017 just before the book, P.O. 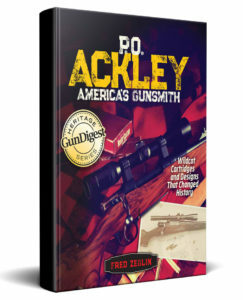 Ackley, America’s Gunsmith came out I had a chance to visit Salt Lake City. I was there for the Western Hunting and Conservation Expo. A great outdoor show I might add. My son and I were there to promote our businesses 4D Reamer Rentals LTD and Z-Hat Customs LLC respectively. When the show was over I asked my son how he felt about a little field trip? Where?, he asked. P.O. 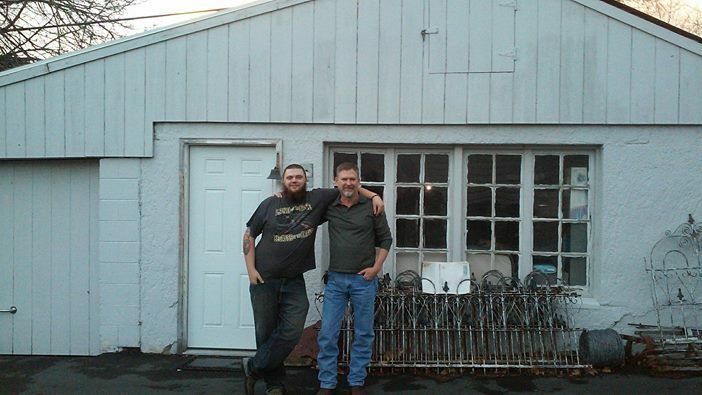 Ackley’s old shop I told him. He was excited to check it out as I was, so off we went. Fred and Dewain Zeglin in front of the Chicken Coop where Ackley made many a barrel. He introduced himself as Dustin. He smiled big and said, “I’m Ackley’s Great Grandson.” He graciously invited us in and took us back to the shop so we could get a picture in front of it. Jim Chappell with prized possessions, P.O. 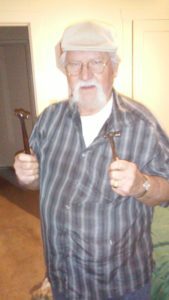 Ackley’s hammers. Not much later Jim Chappell (P.O.’s Son-in-law) came home, we introduced ourselves. Jim asked a few questions about the book and how I did my research. I had talked to his wife Jackie many years earlier in the research phase of the book. Also Jim’s nephew had provided a fair amount of material for the book. Then Jim invited us into the house to visit a bit. Jim went to his room and came out with a couple of hammers. He said, “I rescued these from the shop a long time back because I figured they would disappear if I didn’t.” His pride in his Father-in-law was obvious. Jim and Dustin could not have been nicer to us if they had tried. Good People. It was great meeting both of you, and visit for a bit. Seeing that Great Grandpa’s work is still appreciated and admired brings a huge smile to my face! I truly look forward to the read. My son and I very much enjoyed meeting you as well. Thanks so much for your hospitality! My son is Dustin. My grandfather was P . O. Ackley. He was a great man. As you might imagine, I spent a lot of time researching your Grandfather’s career. It has brought me many hours of enjoyment and entertainment. He managed to meet and/or work with some of the most famous gun people in the U.S. He trained a huge number a barrel makers and gunsmiths over the years. His influence on the gun industry is much larger than most people will ever give him credit for.